Throughout its brief fifty-year history, the Pere Marquette Railway’s Lake Michigan car ferry fleet played a significant role in the development of railroad ferry service, both in the United States and abroad. The fleet began modestly in 1897 with a single ship, only five years after this type of craft was introduced on the Great Lakes. By the early 1900’s the fleet had grown to six vessels and had surpassed its rivals in terms of size and sophistication of operation. The PM was so successful that their marine managers were consulted by ferry operators who sought advice on vessel construction, dispatching, and icebreaking techniques. Representatives from Finland, Russia, and Great Britain made periodic visits to observe the operation firsthand. Later, the Florida East Coast Railway developed a fleet of car ferries running to Cuba that were very similar in design and dimensions to those operated by Pere Marquette. 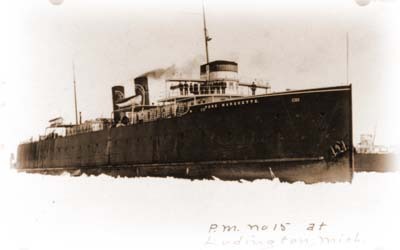 At various times between 1897 and 1947, the Pere Marquette operated a total of 13 ferries on Lake Michigan, running between Ludington, Mich. and Milwaukee, Manitowoc and Kewaunee, Wis. These ships were then an efficient means of bypassing the congested rail yards in Chicago. They plied routes varying between 60 and 97 miles in length, and were often plagued by violent storms and heavy ice. Given the fact that most of the cross-lake runs were made at speeds of 12 to 14 miles per hour, a remarkable volume of freight was carried. In those fifty years the Pere Marquette car ferries made well over 160,000 lake crossings and transported roughly 4.5 million railroad cars loaded with over 75 million tons of freight. Even these numbers are somewhat conservative, as early records no longer exist. They also carried approximately 1.6 million passengers and after the mid-1920’s, about 380,000 automobiles. Additionally, over the course of its history, the railroad operated a total of 4 river car ferries. These ran between Port Huron, Mich. and Sarnia, Ont., and between Detroit, Mich. and Windsor, Ont., connecting the PM’s Michigan and Canadian lines. In 1947 the Pere Marquette Railway was merged into the much larger Chesapeake and Ohio Railway. For many years thereafter, the Michigan rail/marine operations were known simply as the “Pere Marquette District of the C&O Railway.” Ferry service continued and expanded for a time, but by the mid-1970’s, the C&O and its rival Lake Michigan ferry operators contended that their services were no longer economical to operate. High fuel and labor costs, and faster, more efficient train handling and routing had rendered the ferries obsolete. The ferry operators were ultimately successful in their abandonment efforts, with routes systematically abolished beginning in 1978. The last cross-lake railroad ferry ended service on November 16, 1990 when the former C&O Railway car ferry Badger made the final trip between Kewaunee and Ludington, thus closing the final chapter of a near-century-old institution. Currently, the Badger operates as an auto and passenger ferry between Ludington and Manitowoc, sailing May through October. She is the last steam passenger ferry serving the Great Lakes. For information and reservations call Lake Michigan Carferry Service, 1-800-841-4243.